Copyright 2012 The Hillbilly Bride. All Rights Reserved. "...The Only Salt I Want to Eat For the Rest of My Life!" These were the words that greeted me, barely awake, as I made my way to the coffeepot the morning after my first shipment of Real Salt arrived. Hillbilly was standing at the kitchen sink eating an egg sandwich. We have a firmly established “leave-mama-alone-until-she-has-her-coffee” routine at our house. And the man was talking to me about salt!?!? “That's nice, honey,” I replied, while gritting my teeth at this most unwelcome first-thing-in-the-morning enthusiasm. “No, seriously. This is the best salt I have ever tasted! You have to try this.” Knowing there would be no peace until I tried the salt, I gave it a try. And you know what? This is the only salt I want to eat for the rest of MY life! So, what's the big deal? First of all, this is no ordinary salt. It is truly the very best tasting salt ever. Even better, it is completely natural, 100% unprocessed and, unlike iodized table salt, contains no GMO. But, salt is bad for you, right? Wrong. Unprocessed sea salt contains over 60 trace minerals. Iodized table salt has been stripped of virtually all minerals. In fact, most salt manufacturers extract these valuable minerals and sell them to vitamin manufacturers, among other industries, before further processing the salt that becomes what most of us think of when we think of salt. The absence of these minerals contribute to developing high blood pressure and cardiovascular disease. All sea salt is not the same. If your salt is a beautiful white salt, it has been processed. Before finding Real Salt, we were using a gorgeous Mediterranean sea salt, believing it to be a better choice. While it may have been a better choice...research led me to find that it was not the best choice. I firmly believe that Real Salt is the best salt for my family's nutrition. The fact that it tastes fantastic is just a bonus. I encourage you to visit Real Salt 101 and learn more about this wonderful product and ask yourself, “Is your salt real?”. I am pleased to announce that I have been in talks with Redmond Trading Company and they are now offering readers of The Hillbilly Bride a 15% discount on any of their wonderful brands, including Redmond Clay (review to come soon)! Just use the promo code HillbillyBride at checkout. All purchases over $35.00 will receive free shipping. There is no expiration date on this promo code. 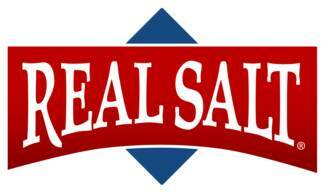 Stay tuned for an announcement later this week about a fabulous Real Salt giveaway! Please read my disclaimer/disclosure notice statement here.